The high number of international visitors outline why the Intersec is of unique value for all target groups of the safety and security industry. 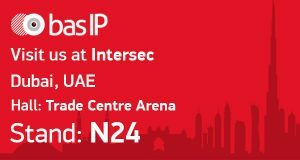 This year at the exhibition, BAS-IP will present new models of IP devices and also other popular products with enhanced functionalities. What’s more, we will present our new multi-format readers with UKEY mobile access, latest unique multi-apartment outdoor panels, and our most up to date concierge monitor. Our team will be present at the stand to show you all personally our products and its operation. Come and visit us at stand N24!